A tip for those who have no experience of small islands: on a small island, wherever the wind blows and regardless its intensity, you will always find a sheltered spot. 2 The town has been developed around the beach, allowing you to rent an apartment or hotel room almost right on the beach. 3 The bottom of the sea is gently sloping so you can play up to you knees in water up to 50 metres from the shore. 4 The town is all on the level, like the beach, with a cycle path alongside the sea. 5 If you want to stay for lunch or dinner you can choose between a variety of pizzerias and restaurants either in the town centre or along the beach. 6 Everything you need is on hand, entertainment included-. 7 Apart from some very well equipped beach resorts, there are also long stretches of public beach too. 8 When the wind is northerly the amazing blue tones of the sea will astound you! P.S. 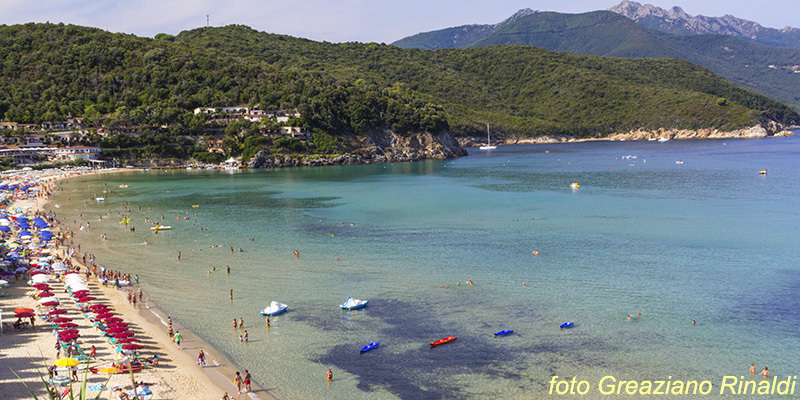 Marina di Campo is one of the most popular tourist resorts on Elba, so don’t try and do a Robinson Crusoe on the 13th August! 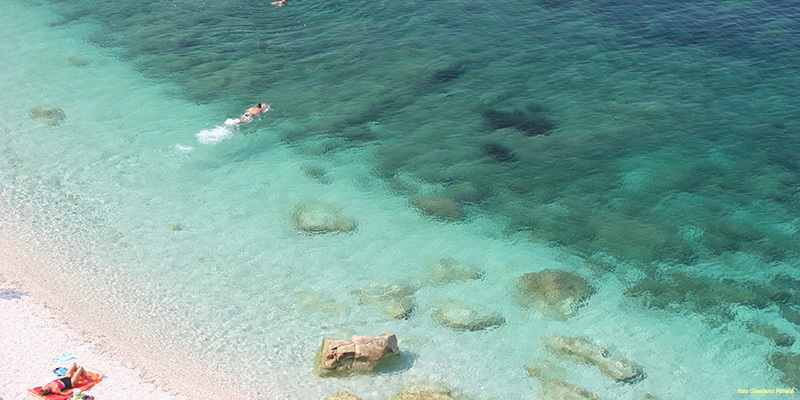 This aspect is however strictly when there is a Scirocco wind, which unfortunately isn’t so rare on Elba…….in fact it’s true that in summer the bathers on the north coast can enjoy an extraordinary natural spectacle whereas the same hot humid wind doesn’t capture the same enthusiasm in other situations. Lets say anyway, that you are about 400 meters from the beach at Capo Bianco, on the same pebble beach (not really the same, as this is actually quite rare in the Mediterranean) and with a sea that has such a brilliant transparency that it makes you understand the word “aquamarine.” Just look around because there are two things you shouldn’t miss, there’s one behind you and one in front. Behind there are white eurite rocks that have produced the mythical white pebbles that are something like the marble of Carrara used for statues (we’ll talk more about that later). In front, if you have the patience to wait a while and are astute enough to arrive when you don’t have to pay the parking (€2 if you arrive after 17,30), you will have a free entry to the best melting sunset that Elba can offer. Until a few years ago, despite the existence of a camp site, the beach at Sansone had very few visitors, but word gradually got around and now there is a long line of cars along the road and you can envisage the crowd of bathers having a good time just 400 meters away on the shore line below. The footpath to the beach descends to the beach and you walk 10-15 minutes, this is not always easy. This discourages the less enterprising and families with pushchairs. After the first stretch of the path 400/500 meters from the road) you arrive at the initial long beach which is around 100 meters of white pebbles, but you haven’t arrived yet, this is Sorgente beach. 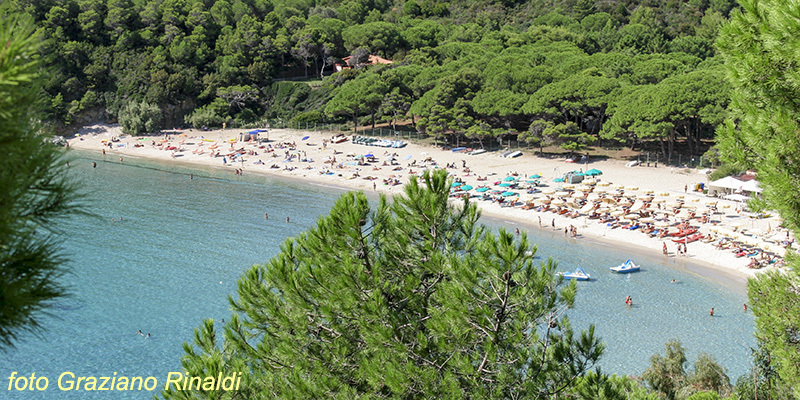 Now, you should climb up a short stretch where at the summit you can see the majestic beach of Sansone spread out. At this point you will regret all the swearwords spoken along the way, and you will be looking forward to washing off all the sweat in this marvelous blue sea that has opened up before you. If you are a born swimmer, set off to the west towards Enfola Point. The sea bed there is one of the most beautiful on Elba, and about 300 meters from the beach along the coast, there is a stack which you can swim under. Do this when the wind is blowing Scirocco. You can hire beach umbrellas and beds, and there is also a small bar. Porto Azzurro has in recent years become on of the most popular seaside towns. A seventeenth century fortress dominates the town, and the lovely square overlooks the tourist harbour and sea, you wouldn’t believe it but I assure you that there is even a small beach on the edge of the town just adjoining the tourist harbour, you can swim there in clear luminous water. The beach on the east side is called La Rossa, as originally the sand was rather earthly, but now the town council has made some changes and now provides free beach umbrellas and beds and this has proved very successful. La Rossa is only about 100 meters long, even smaller than La Pianotta, the beach on the west side which is about 700 meters away. 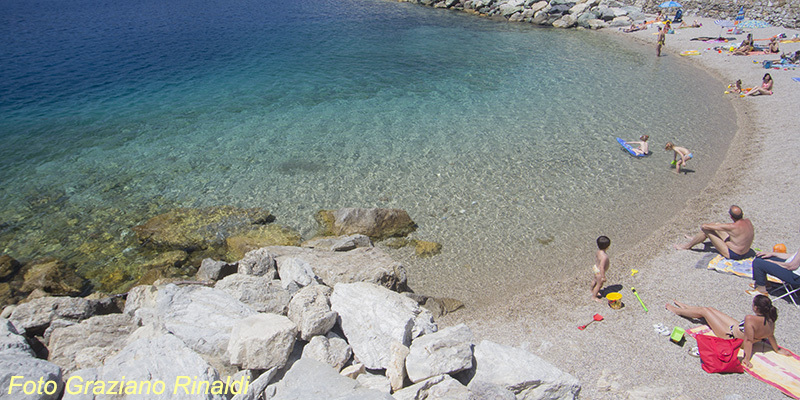 Here, umbrellas are not provided but the sea is unbelievably clear for a beach in the centre of town. Try and believe it ! (Exposed only to the east wind). On the eastern side of the gulf of Biodola, separated by a series of yellow rocks topped by a white seventies style villa, there is a besieged precious pearl: the beach of Forno. No longer than 150 metres and well protected from northerly winds, from here a gulf to gulf vista opens up which is one of the greatest natural scenes on Elba. The sunsets in summer are a bright orange and although crowded it seems to be in a world of it’s own, just a few residents and the many habitual tourists and where the fishermen transform themselves in to waiters. The biggest difficulty is parking, but this may be a way to keep the density of visitors under control on the small but splendid Forno beach. Initially, there were high dunes of fine golden sand protecting a long beach softly running down to a huge expanse of sea. The surrounding area has been transformed into a vineyard framed by endless forests of tall trees that embrace the landscape, almost isolating it from the rest of the island, this is paradise on Earth. After the vineyards come the houses and hotels, the dunes and the beach resorts, but the not all the charm of that natural environment has disappeared from the beach at Biodola. Visiting on a day when the Scirocco wind is blowing is worth while despite difficult parking. Most of the 800 metre beach is still public, it is one of the greatest and best equipped Elban beaches with restaurants, bars, resorts, car hire and hotels. 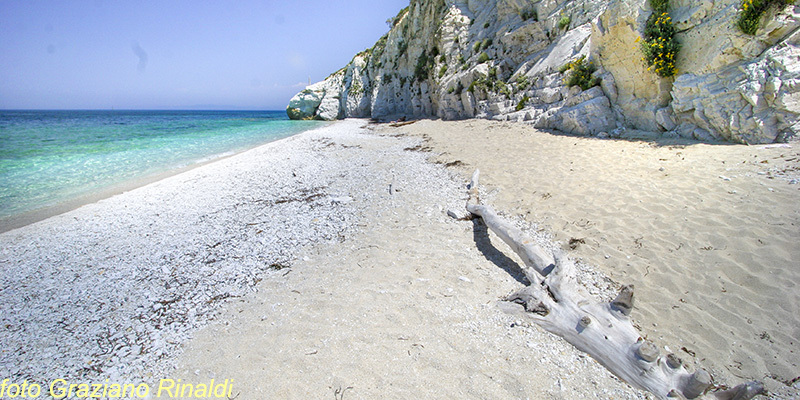 There is an easy footpath to the east which goes to the tiny Scaglieri beach, 150 meters exactly, with the same characteristics of it’s sister beach although much smaller. Even at the cost of going mad looking for parking and braving the crowds, you should still have a dip in these waters. Especially swimming along the southern cliff, where the waters is shallow so there are great underwater views. Of course you may not want to share the beach with crowds of others all lying out on towels but I have to say that this only happens in the peak season, otherwise it’s very liveable. You can choose to stay on the public beach and rent umbrellas and sun beds, which are made available by the two beach resorts. 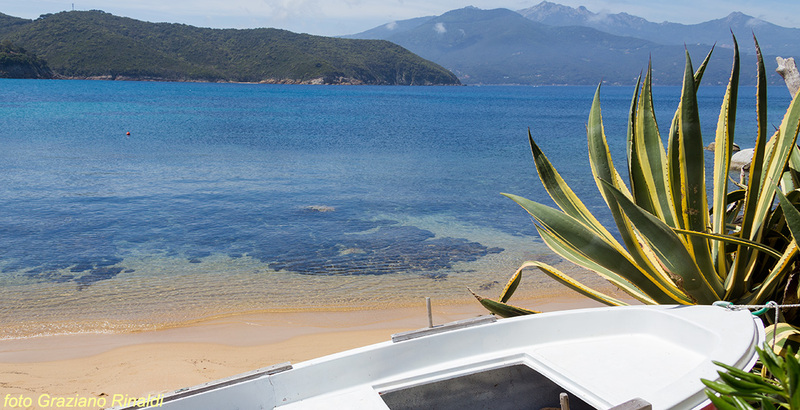 You can also take refuge in the restaurant bar on the beach and enjoy this glimpse of blue from your table, it really depends on the season in which you visit Fetovaia. Some photos of Fetovaia beach with information and tips are to be found in this article. Not to be missed for young people 15 to 35 years old, white sand, clear sea, flat rocks on the edge of a bay that seems designed on a drawing board, it looks just like a perfect half moon. Cavoli is also the beach close to the heart of those who want to dive during the mid-season and even in winter, because of its situation just to the south, its special sheltered location and shallow waters make it a sort of spa pool with the sea always warmer than all the other beaches of the island of Elba. This post presents the beach from different points of view, even from the parking point of view: during the high season, just think about this tip, if you don’t find any place to park, take a right inner road in front of the parking lot along the road before Seccheto, it is a paved road leading to an old unused sports field, you can’t go wrong there, as there is always room. 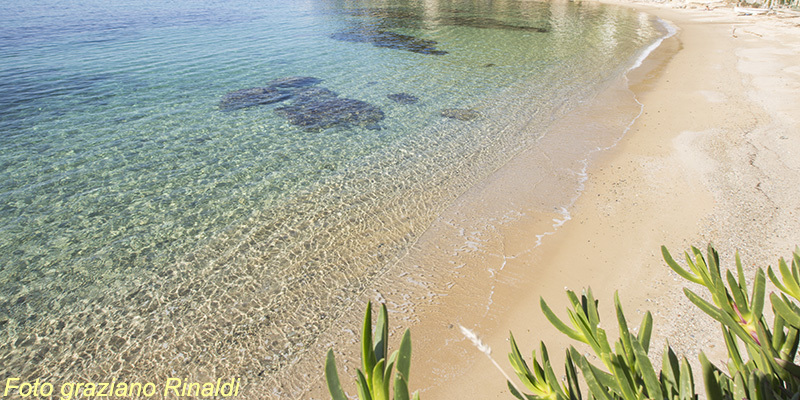 In the event that the Cavoli beach was too crowded for you or for some other reason you change your mind on the spot, an excellent alternative within walking distance is the beach of Seccheto, just further along the road from Cavoli going west. This great beach located in the south-central part of the island, in the town council of Capoliveri, would not be everyone’s choice for classification among the top 10 beaches of the island. But I assure you that it is only a prejudice. It is not the traditional beach of fine golden sand , but a beach of a small fine stones with a covering of dry leaves of Posidonia. Norsi deserves at least one visit and a dip in the sea. You will see it along the road that leads from Porto Azzurro to Lacona, it is divided from the nearby beach Acquarilli by a majestic cliff of very dark serpentine rock .You will be impressed if you go there when the winds are blowing west, especially the Mistral wind as you can swim in a sea that seems huge and bright: try to swim far enough around the cliff to nearby Acquarilli, the sea around the rocks is a wonder! Have a look at this article which describes the special features from the point of view of a regular visitor, perhaps even a little “addicted” to it.